The makers of Tequlia Ocho are convinced the concept of terroir can apply to agave as much as grapes. So they are making three single estate tequilas, a silver, resposado, and añejo, to prove their point. I was lucky enough to receive a sample bottle of their 2008 Plata to give a try. Naturally, as I have no other vintage to compare it to, I cannot speak to the importance of the labeled year. What I can say is this is an excellent silver tequila. Made from 100 percent agave, all the piñas were harvested from a single estate, in this case the Carriza. It is located at 1,978 meters (6,490 feet) above sea level. As a highland tequila, one should expect more fruit tastes, and Ocho Plata delivers. On the nose, there is a clean agave sweetness. Tasting it, the dominant flavors include a sharp citrus and the peppery notes I associate with quality plata tequilas. Another flavor I find is a mild note of almond. This is the sort of tequila that I might even want to sip over the rocks from time to time. This makes a great margarita, and I especially enjoyed it in my Sonora Sour. Unlike a more mild tequila like Inocente, the Ocho Plata creates a rich, tequila-forward margarita that shows how this spirit can be truly enjoyed for what it is instead of covered up by sour mixes. Wanting to expand my tequila repetoire, I hit my cocktail books for additional ideas. In The Essential Bartender’s Guide I found the Agavoni. This variation on the Negroni replaces the gin with silver tequila and two dashes of orange bitters. It was created by Bastian Heuser for Mixology Magazine. Build in rocks glass over ice. Stir to mix well. Sip on a sultry evening. I was truly surprised how much I liked this take on the Negroni. 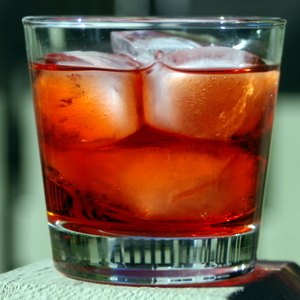 The sweet robustness of the Tequila Ocho Plata makes an excellent pairing with the Campari and sweet vermouth. This is definitely being added to my list of favorite ways to enjoy tequila. I’m really happy to have a bottle of Tequila Ocho Plata in my cabinet, especially since they only made 11,088 bottles in 2008 (my bottle is number 5045). I’m interested enough that I will probably make the effort to find a bottle of the 2009 vintage when it is available so I can see how it compares. This look SO deliscious! i never thought of subbing the gin for teqila, its brilliant! and the orange bitters is just perfect.